The heart can surprise you at any age. When I first met my grandson I was overwhelmed by my feelings of longing, delight, wonder, and adoration. I knew in a flash I had been captured by love again. 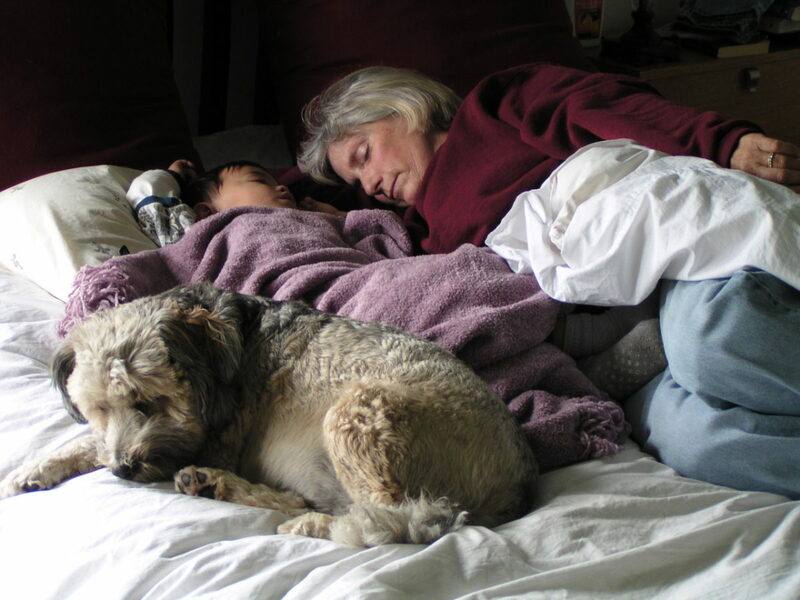 Grandchildren are perhaps the number one reason for writing memoirs. Your stories can guide them through the pitfalls of their lineage, let them know they are not alone with their feelings and struggles, remind them of how much they were loved. Your memories of them will be a gift that lasts a lifetime. They need you to know where they came from. Grandparents are the roots from which they will grow. It took me a long time to be myself with Tiger, the real name of my grandson. In his presence I became a babbling idiot, talking in a high-pitched voice only small dogs could hear, my mouth filled with baby talk I couldn’t control. I pushed him down the sidewalk in everything with wheels, then in swings and tires in the park. We walked the dogs together, and visited a friend who owned a camel named Issac. We watched Lion King until it wore out. My son and daughter-in-law took pity on me and gave me a day a week to be with Tiger. It was called Grandma’s day. When Tiger got a little older we used this day to eat pineapple pizza, pet puppies at the pet shop, go to the park, and when we came home we played ping pong. One day we realized everything we did started with a “p”. When Tiger got old enough to understand Superman, we watched it every afternoon we spent together, once a week for a year. Tiger got the red and blue pillowcase from the linen closet and I attached it to his tee shirt with safety pins and we started the video. He often kept the cape on the rest of the day, flying around the back yard and jumping from the stone wall. At the grocery store he would ask the clerk, “Guess who I am?” And if he had his cape on they would say, “Why, you’re Superman.” Once he asked and he didn’t have his cape on. When the clerk said she didn’t know, he looked behind him, realized he was cape-less, and said without hesitation, “I’m Clark Kent.” I was grateful the clerk was old enough to know Clark Kent was Superman in disguise. While Tiger was young I had chickens. Each hen had a name. French toast began with a trip to the hen house for eggs. Tiger didn’t like the goo on his hands so I cracked the eggs while he got the eggbeater. He liked the electric one best and stood on a stool at the counter over his bowl, egg splatter going everywhere. When his parents divorced he was beyond comforting. No reason was enough to make him approve of his father moving away. I realized there was no divorce possible in the body of a child. He was blended, by every atom, to belong to both of them. It brought me back to the time I divorced my son’s father, and how I felt when my parents divorced. It was a dark time waiting for the roots of our lives to untangle and blend into new forms. Tiger took up the violin and we discovered he was a musician. My father was a concert pianist, my cousin was a famous bandleader, Tiger’s father writes hauntingly beautiful songs. Tiger found that thread in himself and made good use of his pain. He called me when he learned Twinkle Twinkle Little Star. I was driving to Ojai from LA on the freeway. Through my ear buds I heard the tune. Each time he got to the end I said, “Play it again.” Then we sang, “How Much Is That Doggie in The Window” for a half hour. When I finally came to my senses I was halfway to Bakersfield. I’d missed my exit. To give him a voice to discuss the painful patterns of our family, we gossiped. He and I talked about everything and everyone. I told him I’d been a hippy when I was young and got in trouble with drugs and alcohol. I told him how I hurt his father while he was growing up so he shouldn’t blame him for things he doesn’t know. Write about the special relationship you have with your grandchildren; or, if you are too young, a sibling or a childhood friend. Let the words pass from your heart to the page. Every memory of a loved one is a treasure no one can take away. When I saw the photo of you with your grandson I thought it was an advertisement layout for fall fashion. The colors were so muted and beautiful. The three of you were definitely at peace. The story was beautiful too. I have no grandchildren and have made peace with that reality. I have a niece who has a son and I’m called “Granite” How interesting that you gossiped together. He will remember those times always. So great. Tiger is a really interesting character. Thay name with him being a musician, are neat juxtaposition. Plus the gentle photo. I can feel your love for him coming through. And you set up plenty more I want to hear about with family, especially with the “hauntingly beautiful tunes.” Wonder about the word “hauntingly” since it feels like subtle undercurrent? Enjoyed very much. Eggs will be thought of in new ways…..
That photo is so lovely. It’s an image of connection, closeness and love. I wish I had the same tender stories about me with my grandchildren. I did push them in strollers and on swings when they were little. I helped them navigate the slides at the parks and learn to climb to new heights but as the years have passed and they have entered their late teens and early 20’s I have lost that fragile connection. I live 2 hours away and their lives got busy years ago. I regret not making more of an effort to spend special time with them. We do celebrate each birthday and every holiday together. We come together over food and special meals prepared with loving hands. Christmas is especially fun and like my son says, mom, you are Santa. I hope as they continue to mature I will be able to share more stories and wisdom with them since now they already know everything there is to know.